While body markings and modifications appear across all cultures in New Eden, it is the Minmatar who have taken that most ancient method of body marking, the tattoo, to a whole new level. To the Minmatar, the tattoo is not simply a form of art, but rather an integral part of their culture and customs. When the Minmatar Empire was in its heyday, before a single Amarr ship ever darkened its skies, the Minmatar had truly made the tattoo into a form of high art. It was said the best artists could breathe life into the skin of an individual with their work. Today’s works, although still beyond what other races can achieve, are mere scribbling compared to the greatness of their predecessors. 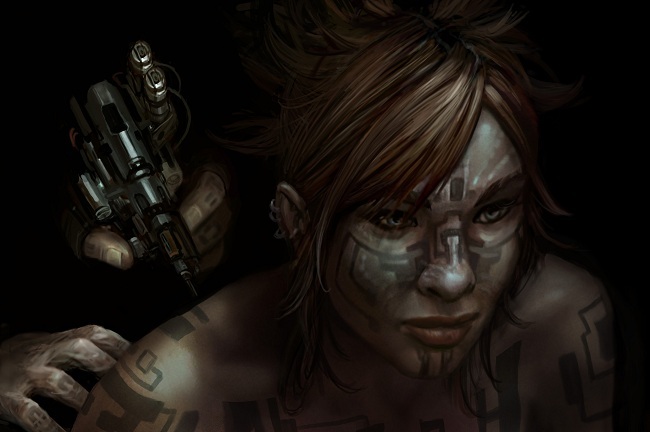 The Minmatar tattoo artists of today are forever seeking to regain the knowledge and skill that was lost to them when the Amarr, during their occupation of the Minmatar, issued an edict banning the practice. This was a savage blow to the Minmatar, for a Minmatar’s tattoos proclaim who he is, where he came from, what he does, where he has been and what he has experienced. They represent a Minmatar's identity as well as his story. A Minmatar without his markings is not considered a Minmatar at all. Such a one would be as alien to the Minmatar as a universe without God would be to the Amarr. In this, as well as in myriad other ways, the Amarr began to erase the Minmatar’s culture and identity, converting them into more pliable slave stock. During the millennium of enslavement, the Amarr all but eradicated the tattoo culture. Nevertheless, it managed to survive in various different bastardized forms until the Great Rebellion, when the Minmatar finally threw off their shackles. What followed was a long hard struggle for the Minmatar to regain all that was lost to them during the occupation, and within the context of this endeavor the culture of tattoos was given primacy. The Republic of today is enjoying a renewed ascendancy of this ancient art form, with the tattoo once again representing an integral part of Minmatar culture and being. While the forms and styles of tattoo vary across tribes, the structure and culture behind the art are surprisingly uniform, making it a strong source of cultural bonding between the tribes. For the first few years of her life a Minmatar infant has bare skin, and it is left symbolically so. When the infant reaches a certain age she is given a temporary naming tattoo, which identifies the child and tells which clan she comes from. This temporary marking is renewed as the young Minmatar grows. It is the only tattoo a Minmatar child is permitted to wear until the Voluval. The Voluval is the sacred coming-of-age ceremony for the Minmatar. It is here that the individual transforms from a child into a fully recognized member of their tribe. At the height of the ceremony the presiding shaman will finalize the ritual by invoking the Voluval mark, where the soul and destiny of a person are said to be revealed through the emergence of a tattoo on the recipient, the secrets of which are closely guarded by the Vherokior mystics who kept it alive during the long centuries of subjugation. The Voluval is considered the most sacred mark a Minmatar can carry, and in some rare cases can change his life irrevocably. Although the significance attached to the Voluval mark has waned considerably in today’s Republic, certain marks can still see the recipient cast out from his clan and tribe, and conversely certain marks can lend the bearer much acclaim. In nearly all cases, however, the mark falls somewhere between these two extremes and the bearer moves on with little effect. After the Voluval ceremony the young Minmatar will receive her permanent naming mark which will reside forever on her face. This mark will identify the name, clan and tribe of that Minmatar, plain for all other Minmatar to see. In such a way, two Minmatar meeting for the first time can immediately know these fundamental specifics about each other. After the Voluval, the markings the individual will carry can vary greatly depending on the course of his life, where he travels, his occupation and what great achievements, if any, he has made. Each will reside on a specific area of his body – a person’s ranks within their occupation and their clan are usually displayed on the shoulders, for example. In modern society many such tattoos are covered during day-to-day affairs. For example, Republic Navy personnel will wear uniforms with rank identifiers, but their true mark of rank is considered to be their body mark, even though this is not usually displayed. The culture of tattoo is truly ingrained into the Minmatar mindset, pervading nearly every aspect of their society. A Minmatar cannot bestow upon herself just any tattoo. In some cases she may be able to influence styling and shape, but she cannot add a tattoo without having first earned the right. Inking a tattoo upon yourself without permission is considered a grave crime and offenders are subject to severe judicial punishment. Because of this arrangement, a Minmatar who is heavily tattooed is more respected by her peers, which will allow her greater opportunities to advance. Her experience is there for all to see. The Gallente find the culture of tattoos somewhat barbaric and uncivilized, and early on tried to persuade their Minmatar neighbors to drop this old custom and embrace their future as a civilized nation. Their efforts to this end were initially met with polite denials and later with derision, but interestingly the Gallente youth now find the custom fascinating. Indeed, it is not uncommon to see young Gallente teenagers sporting tribal and gang motifs lifted from their Minmatar peers, symbols of whose true meaning they have little to no knowledge. This can evoke anything between high derision and outright hostility when those so inked encounter true Minmatar.